John Mead Gould (1839 - 1930) was the author's Great Great Grandfather. He served in the Union Army during the Civil War and rose to become the Major of the 29th Maine Regiment in 1864. He authored "The History of the First, Tenth and Twenty Ninth Maine Regiment" which was based the diary he kept during the war. JMG's war diary contains great insite into both his life and times. It gives JMG's concise and frank observations about Army life, the Civil War, slavery as well as the moral climate of the south during the reconstruction. In reading the diary the reader gains an appreciation for JMG's virtues and vices as well as his dry but sharp wit. The diary has recently been edited by William B. Jordan, a noted Maine historian, and published by Butternut and Blue Books of Baltimore. (Note - this author won't make a dime off the diary.) A review of the diary is HERE. Unless otherwise indicated, the diary should be considered the primary source for information relating to JMG's life from 1861 through 1866. JMG's diary now resides at the Center for Maine History in Portland. In another moment of foresight JMG wrote a brief "Personal History" in 1912. Written on a 20 page bank account book, it contains a number of key dates and facts relating to his life and in in the pocession of this author. It will be sited as "PH". Another resource for research on John Mead Gould and the 1st-10th-29th Maine Regiment is Mr. Nick Picerno. Mr. Picerno has built the largest known collection of materials relating to John Mead Gould and the regiment. He is actively seeking to contact descendents of the regiment and may be e-mailed at maine1st10th29thinfantry@yahoo.com. In May of 1844 his father bought number 46 Pearl Street (later renumbered 148). The house would be JMG's primary residence for most of his life. He grew up there with his two sisters and three brothers. JMG's older brother was William Edward Gould (d. 1919) who followed in his father's profession of banking. In 1859 William married Emma Maynard Dow. She was the daughter of Neal Dow (1804 - 1897) who was a leading prohibitionist and Mayor of Portland from 1851 -1857. Dow was also commissioned a Brigadier General of Volunteers during the Civil War. Being closely related to such a prominent person may explain JMG's good fortune in climbing through the ranks of the Army as fast as he did. His first formal education was by a Mrs. Haines of Portland. (PH) As his family, on both sides, had relatives in Bethel, Maine his family spent a fair amount of time there while he was growing up. In September 1853 Gould had his first job as a "boy" at the Merchants and Traders Bank where his father worked. JMG attended Gould Academy in Bethel from February 27th, 1854 to November 17th, 1855 (ironically, he was not related to the Gould for whom the school was named). He also attended Gorham Academy, near Portland, from June 5th to August 12th of 1855. He re-entered the employ of the bank on August 30th of the same year. JMG found a lifelong friend in Edward Sylvester Morse (1838 - 1925), who grew up in Gorham and attended Bethel Academy near Gould Academy. Morse had a remarkable career as a biologist, Japanese pottery collector and museum curator. JMG financially assisted Morse when he attended Harvard and developed an appreciation for natural science through this friendship. More information about Morse can be found in his On-line Biography. In April 12th, 1861 Fort Sumter was attacked by the Conferates and the Civil War began. JMG was at first saddend by the breakup of his beloved country but quickly became convinced that the Confederacy had designs to undermine the economy of the Northern States and had to be stopped at all costs. Gould enlisted ("signed my 'Death Warrent'") on April 23rd, 1861 for a term of 2 years in the Portland Light Guards, a local militia company. On May 3rd that company, along with nine others of the Maine militia, was inducted into federal service for 90 days. 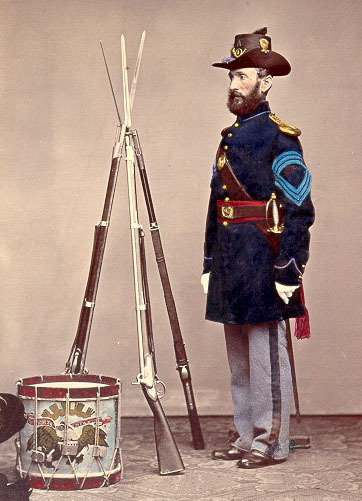 Together they became the 1st Maine Volunteer Infantry Regiment with the Portland Light Guards being designated as Company C.
The First Maine was commanded by Colonel Nathaniel J. Jackson. Jackson would later command the 5th Maine Regiment and be promoted to Brigadier General of Volunteers. JMG was twenty-one at the time and was probably looking for adventure as well as to enter into noble manhood. War often meets these needs in young men - although they usually wind up getting more than they bargained for when they first enlisted. In his later years, Gould would agree with General Sherman that "War is Hell" but he never regretted his involvement in the stuggle to save the Union and abolish slavery. The 1st Maine was quickly dispatched to Washington where were it arrived on June 3rd. Washington at the time was filled with soldiers both for its protection as well as it being the place where the bulk of the Union Army was being formed. The 1st Maine was quartered near the Capitol building. 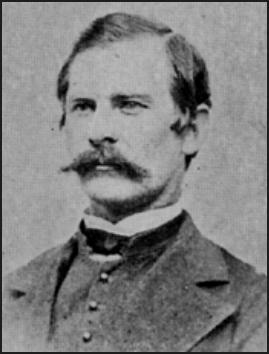 On June 5th Gould visited the Capitol and made the following remarks about the collossal portraits in the rotunda - "The Discovery of the Mississippi is gaudy and the Baptism of Pocahontas has a number of beautiful faces. Poc herself being perfectly beautiful." On June 7th the Regiment marched west to Camp Jackson on Meridian Hill (the present site of the Washington Monument). Gould noted - "Columbia College adjoins us. It has only one building and is not much larger than a good sized High School of our Northern states." Columbia College is known today as George Washington University. On June 13th Gould remarked on the fatal ignorance of an undisciplined soldier of another regiment - "There seems to be queer ideas of duties of guards at night. Some say they shall shoot any man that don't halt at once. A sad case happened around Washington. A stupid sentry shot his captain dead by reason of some mistaken notions of duty or from fright." While in Washington, JMG had a chance to look around. He was given a pass on the 19th and had a chance to look around the city. He visited the White House where he saw an observation balloon being experimented with. 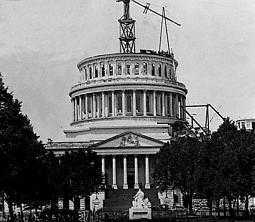 He also saw the uncompleted Washington Monument which he described as - "It is a shocking looking thing, now a mere stub with a derrick and staging on top." 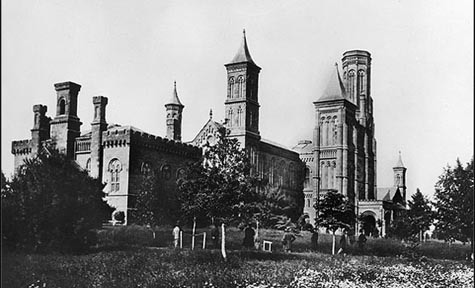 Smithsonian Institution Castle, Washington, D.C.
Gould proceeded to the Smithsonian Institution where he found "many attractions". These included a gallery of paintings of Indians by Stanley and a statue of a "Dying Gladiator" copied after a "great Roman piece" which Gould called "the finest thing I ever saw done in marble". He also made a number of comments about the seashells on display at the institution. He had an aquired appreciation for the subject due to his relationship with Ed Morse. He then toured the Washington Navy Yard - "a long walk but there is enough there to repay one for the walking." At the Navy Yard he saw a wide array of weaponry representing state of the art technology for that time. Gould remarked - "The rifled cannon astonish me. Some are huge pieces and of small bore. The enormous 11-inch guns, with their heavy breeches ar no larger than these, yet the bore of the rifle is not more than 4 or five inches." On a later date he would see an "infernal machine" (which we today would call a submerged mine). Upon retuning to camp Gould observed - "I find out boys are having diarrhea quite extensively. The surgeon they say gives them quinine for everything. The First Maine was still in Washington on July 21st when the Battle of Bull Run was fought. Gould was assigned to guard duty when he heard "a repeated rumbling like thunder". This was the sound of artillery fire and it lasted from 8AM until 6PM. Dispite early reports of a Union victory as time went by the defeat of the union forces became apparent. Gould's conscise analysis of the battle was - "the panic which spread amongst our troops was the fatal blow and the neglect to support the attacks of the advancing regiments was the cause of our final disaster.". As the battle was fought shortly before enlistments ran out, the regiment was ordered to return to Portland. The regiment left Washington on July 31st and arrived in Portland on August 2nd. The regiment was mustered out of service (discharged in today's phaseology) in Portland on August 5th, 1861. Although JMG's term of service had expired, the war had not and he felt that not only that the country but he himself had to do more to defeat the Confederacy. One privation the war did not impose was a lack of opportunity for healthy young men willing to serve in the Army. 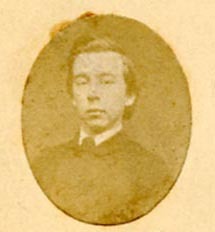 Gould re-enlisted in the 10th Maine Regiment which was formed on September 10th, 1861. The Tenth Maine was a two year regiment, except for companies A, B and D which were composed of men who had enlisted for three year term. On October 1st, 1861 JMG was appointed to the position of Regimental Sergeant Major (the senior ranking enlisted soldier of the regiment). Such a dramatic rise in rank seems unusual but the fact that his father was a prominent businessman cannot be discounted as a factor in his selection. 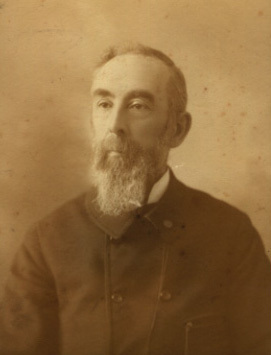 On October 4th the 10th Maine was mustered into federal service with Colonel George L. Beal in command. 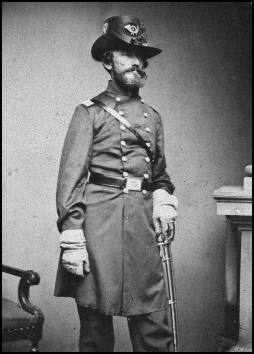 Beal would also commmand the 29th Maine and be promoted to Brigadier General later in the war. 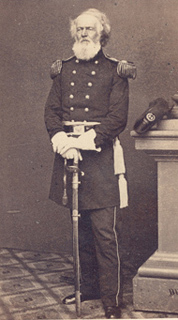 After the war, Beal served as Maine's adjutant general and state treasuer. On October 6th the 10th Maine left Portland for the seat of war. Enroute they took the train from Portland to Boston, changed trains for Fall River and there boarded the steamer State of Maine. The regiment arrived in Baltimore on the 8th. 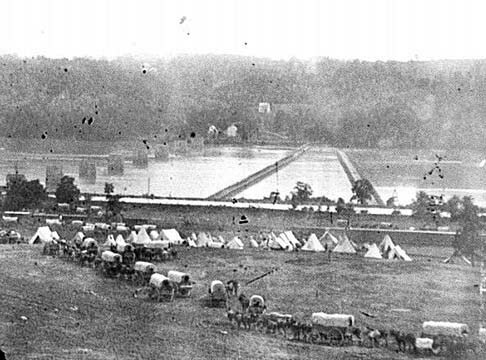 At Baltimore the 10th Maine was temporarally assigned to General Dix's Division until being reassigned to the Railroad Brigade of the Army of the Potomac in November which was charged with guarding the Baltimore and Ohio railroad. The 10th continued in this duty until March 28th, 1862 when it was tranferred to Harper's Ferry as part of the town's garrison as a unit in 1st Brigade of Williams' Division of the Department of the Shennandoah early in April. 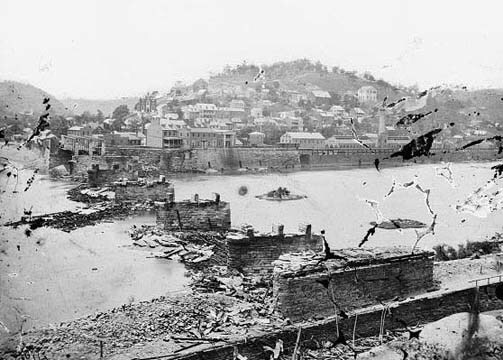 On his arrival in Harper's Ferry Gould wrote - "It is really, or rather was, a town of some note, but the ruin, absolute devastation now in this place is beyond anything I ever dreamed or saw or heard tell of." JMG was promoted as Second Lieutenant of Company E on April 7th, 1862 (with date of rank of March 29th, 1862) and appointed the acting Regimental Adjutant on the same day with the responsibility for the regiment's record keeping and personnel admistration. Gould's natural aptitude for detailed writing and record keeping made him the obvious choice for this position. On May 9th the regiment was moved south to Winchester to act as provost guards. On the 25th a large Confederate force moved towards the area and the inferior Union forces were forced to retreat (skedaddled in JMG's parlance). The retreat left a lasting impression on JMG as to how quickly discipline in a unit can break down as well as his own folly of attempting to carry too many soveniers at once. On August 9th the 10th Maine was engaged at Cedar Mountain, Virginia. JMG made a very succinct anylysis when her wrote - "The 10th Maine hath done nobly under fire but all to no purpose." The regiment was forced to retreat when it was surrounded by surperior Confederate forces but proved that it could be disciplined in time of battle. The 10th suffered high casualties - 173 killed, wounded and missing out of 461 men engaged in the battle. JMG was promoted to the rank of first lieutenant on August 9th, 1862 and permanently appointed as the regiment's adjutant. Such a rapid progression demonstrates that people often gravitiate to where there natural talents lie. As regimental adjutant JMG was reponsible for the maintaining the regiment's records and keeping track of how many soldiers were present for duty, sick, wounded, killed etc. Because of this, as well as the fact that he kept a diary through out the war, he was the natural choice to write the regiment's history after the war. 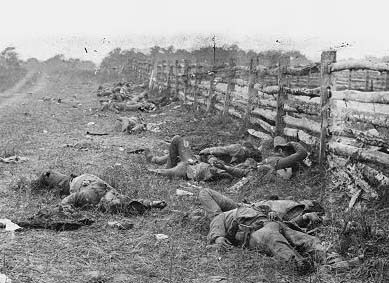 Dead Confederate Soldiers after the Battle of Antietam. On September 15th the 10th Maine saw action at the battle of Antietam in what is called "the bloodiest day of the Civil War". The 10th was assigned to the First Brigade of the First Division of the 12th Corps commanded by Major General Joseph K. F. Mansfield in August. 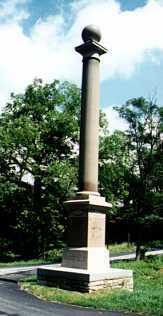 and the monument near where he fell at Antietam. JMG happened to be near to General Mansfield when the general was hit by a stray bullet and mortally wounded. JMG volunteered to help carry the general to a farmhouse where he later died. (Ironically, JMG would later write of how it took four men to carry one man to the rear and there was never a shortage of volunteers for this duty.) In later years some dispute grew as to the circumstances surrounding Mansfield's death and JMG wrote a brief account of the incident which is generally considered by historians to be the most accurate. Information on ordering a recent imprint of JMG's account can be found HERE. A couple of days after the battle JMG saw the remains of the Dunker Church stating - "our gunners must have used it for a fireing mark" and the Burnside Bridge which he pronounced as sturdy. 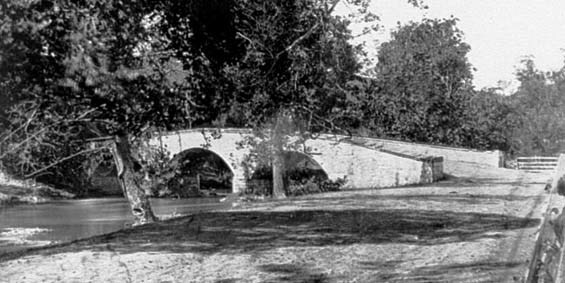 On October 25th the 10th was assigned to guard duty near Berlin (now Brunswick), Maryland guarding a pontoon bridge over the Potomac River. This duty, like the rest of the winter that followed was uneventful. On December 10th the regiment marched into northern Virginia and was assigned to protect the Army of the Potomac's lines of communication with Washington. This duty was inherently boring and JMG moved into winter quarters (which consisted of a tent with an attached chimney. On December 31st, JMG moved his tent and chimney away from the company lines and made the following obsevations - "We did not give them room enough and the shocking profanity of the men is too much for me. I had no idea we had such a set of men. The Chaplain too has concluded he must clear out. He say he has a number of times spoken to the men about it but they do not improve. My own opinion us that the army will in a measure corrupt the nation when the war is over but the nation will certainly have more effect upon the Army than the Army on it." On January 3rd, 1863 Gould's division was reviewed by General Slocum (the commander of the 12th Corps). Gould's comments are self explanitory - "There were 13 regiments, 400 men to a regiment, 5,500 men in all. The moving of so many men placed in many separate bodies is imposing." ... "These reviews are very fine for spectators. This is all the fun there is to anybody. The men have to wait-wait-wait and nearly break their arms holding their guns at a "shoulder" so long. The reviewing officer has his part to do and stands a good chance of getting his death of cold by keeping his head uncovered. On April 26th two-thirds of the regiment received the news that they would be discharged. (The others having enlisted for 3 years rather than two.) The remaining men being organized into the 10th Maine Battalion which was assigned as the provost guard for the 12th Corps of the Army of the Potomac. 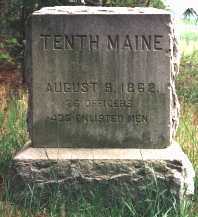 The 10th Maine Battalion was present at the Battle of Gettysburg but was not engaged in combat. The men to be discharged moved out the next day and arrived in Portland on May 1st.